Tony Moly Pokemon has been all the rage in our home these past few months, thanks to Liz at Furianne. 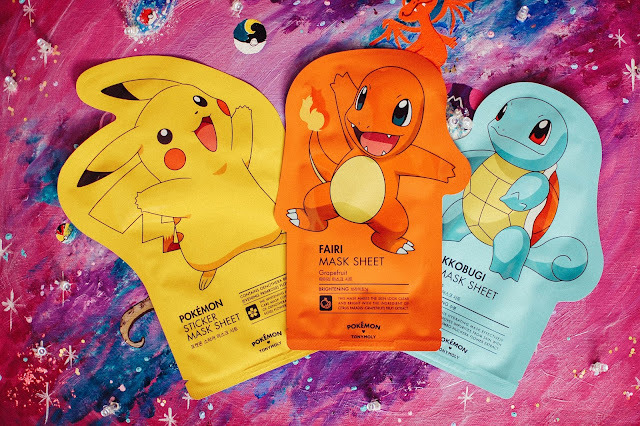 Hand creams, face wash and these guys... the face masks. Savanna and Scarlette both used their Pikachu face masks only a day or two after Christmas when they received them but I tend to linger over items I love and bide a while before using them up. That day finally came. The Charmander (Fairi) Mask smelled amazing, jut like pulpy tart grapefruits. It felt soothing and refreshing on the face. Squirtle (Kkobugi) Mask was a hydrating mask that lent extra moisture to my face after a particularly effective blackhead pore heating and exfoliating treatment I applied a few nights ago. The Pokemon' Pikachu Sticker Mask was more fun than anything. The sheet consisted of "stickers" about the size of a silver dollar: poke ball, Squirtle face, Charmander face, Pikachu face. These I placed all over and let sit. The serum in this one was mild and did not really show any effects other than typical sheet mask hydration. These masks are not on offer at the moment but I did like them enough to explore the Tony Moly line of items more. Do you have any Tony Moly favorites? The hand creams are quite nice and I use them all over. I am new to face masks and Tony Moly. I did procure a sample of snail eye cream from Tony Moly. Pretty excited, I am!